Because of the snow we have expanded our Pinot Noir Wine Dinner. We ran our first dinner last Saturday February 27th. BUT we are offering it again this Friday March 5th!!!! That means if you could not make our scheduled date then we have given another option. 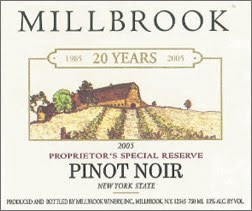 Call right away to make reservations for the second chance Pinot Dinner 845 647 3000. Our Pinot Noir Wine Experience is February 26th. We are featuring Pinot Noirs from around the world. Here are the details.